- The are a few prawns dotted around the shirt. Nothing much to say about this shirt. Pretty standard really. Nice colour combination. I am liking the red trims against the black body of the shirt. Cant say that I am too pleased to see the club logo in the centre of the shirt. Also the shirt is elastic which is my least favourite material to be used on a football shirt. Oh and prawns. PRAWNS! Only Spain would come up with something like this. They seem to go mad for putting produce on their shirts. 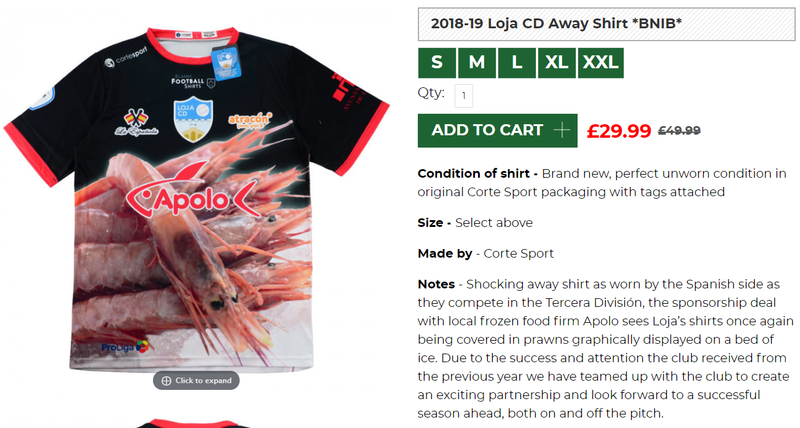 For the 2017/2018 season they released all of their football shirts with a prawn printed design as part of a partnership with a frozen food company.